Our company’s overseas expansion includes the same DNA we’ve had since the days of the Morimura Brothers. Our overseas expansion, which began with insulator exports, has grown to include local production of insulators and HONEYCERAM. As we add new locations around the world, our global expansion has pursued both the flexibility to change and unchanging ideals. 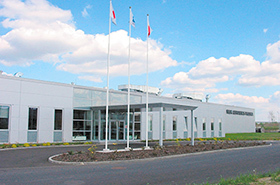 In our international endeavors, NGK has retained the same Morimura Group DNA ever since the time in which the younger Morimura brother, Toyo, established a joint investment company, Hinode Shokai, in 1876, and a separately funded company, Hinode Shokai Morimura Brothers (later renamed Morimura Brothers), in 1878. Our company carried out market research in North America in the 1930s, and it received orders for 20,000 suspension insulators from the government of India in 1935 — the company’s first overseas exports. 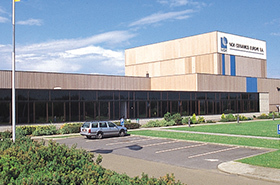 Subsequently, our company founded NGK America (present-day NGK-LOCKE) in 1965 and NGK INSULATORS OF CANADA in 1968, bolstering its insulator exports to North America. We also successfully exported to New Zealand and West Germany (as it was then known). Then, in the 1970s, we began local production at LOCKE INSULATORS. That tough hardship was, you could say, a first for NGK. 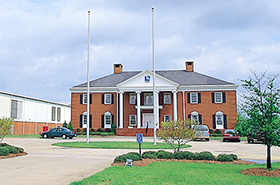 LOCKE INSULATORS, established in 1973 as a joint venture with GE in the United States, was confronted by serious management problems. One of the problems was a rigid relationship between labor and management, which was impeding productivity gains. Despite efforts to reform management, the company faced strikes on two occasions, among other difficulties. However, despite these circumstances, the company pushed forward with management reform that included quality improvements achieved through technology transfers, diversification of products, and promotion of local delegation of authority. After that, labor-management relations and the management environment gradually improved, and business grew as well. 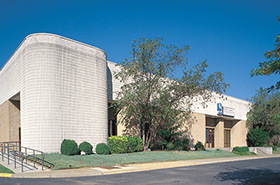 LOCKE INSULATORS became one of the top insulator manufacturers in the United States. In the meantime, NGK Europe (Hamburg) was established as a sales base in 1976 for the purpose of direct expansion into Europe. 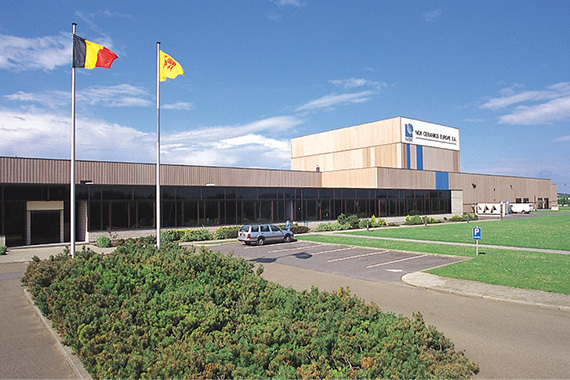 In 1977, we bought up MNPB and established NGK Baudour in Belgium to begin insulator production there. 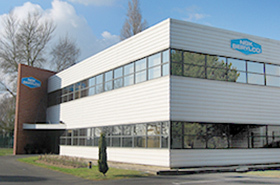 Then, due to growing demand for HONEYCERAM, NGK CERAMICS EUROPE S.A. (ACE) was established in Belgium in 1985. Whereas LOCKE INSULATORS and NGK Baudour were established by acquiring local companies, ACE was the first company built as an overseas production base at our own expense. 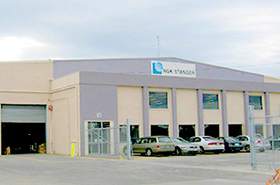 NGK purchased the property, built the factory, and carried out production preparations all on its own. These efforts faced numerous problems due to significant differences in culture and customs, but operation began in 1988. NGK then immediately proceeded with its second and third facility investments in response to growing demand. 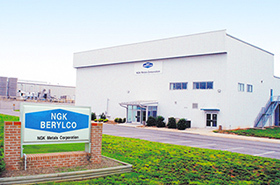 NGK CERAMICS USA, INC. was established in 1988 due to our policy of optimal production allocation between Japan, the US, and Europe for HONEYCERAM production. 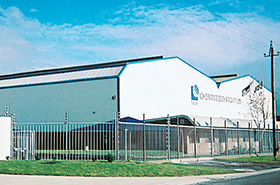 Production capabilities was enhanced with additional facility investments, much like in Europe. Subsequently, production bases for HONEYCERAM expanded to Indonesia, South Africa, China, Poland, Mexico, and Thailand, as our company pushed to establish production close to the markets where products would be consumed, building and expanding our global production network. NGK CERAMICS POLSKA SP. Z O.O. 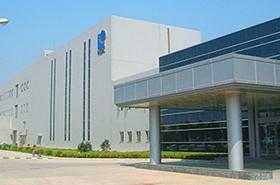 (ACP) has undergone remarkable expansion, with mass production of SiC Diesel Particulate Filters (DPFs) beginning in 2005. 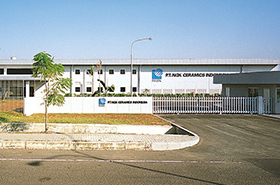 After that, production capabilities for large-scale HONEYCERAM and DPFs kept increasing, and the company started production of NOx sensors in 2013 and Gasoline Particulate Filters (GPFs) in 2016. 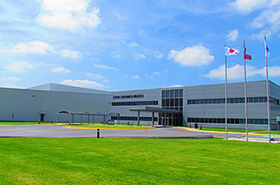 The company added a second assembly line for NOx sensors in 2014 and constructed the second plant for increasing production of SiC DPFs in 2017, growing to become one of NGK’s largest overseas locations. Local production bases for our power business have also expanded. We have established P.T. WIKA-NGK INSULATORS in Indonesia, NGK STANGER PTY. 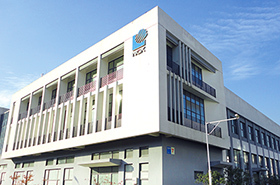 LTD. in Australia, NGK-LOCKE POLYMER INSULATORS, INC. in the USA, NGK INSULATORS TANGSHAN CO., LTD. in China, Birla NGK Insulators Private Limited in India, and NGK INSULATORS SUZHOU CO., LTD. in China. 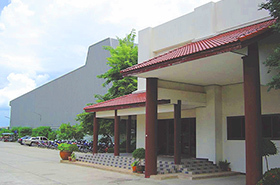 In our industrial process business, we have established NGK TECHNOCERA SUZHOU CO., LTD. in China and SIAM NGK TECHNOCERA CO., LTD. in Thailand. In our metals business, we have established NGK METALS Corporation in the USA and NGK BERYLCO FRANCE in France. 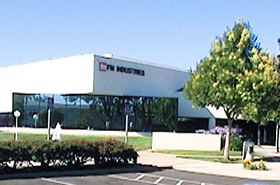 In our high-performance ceramics business, we have established FM INDUSTRIES, INC. in the USA. 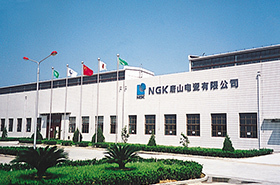 NGK INSULATORS TANGSHAN CO., LTD.
Our purposes for expanding overseas were originally to contribute to Japan and to acquire foreign currency. Since the 1970s, we have responded to rapidly changing economic conditions, including the reduction of currency risk and a shift to local procurement. 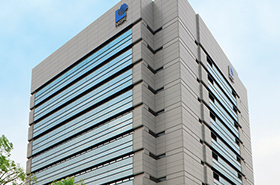 For example, We restructured our business by closing NGK INSULATORS SUZHOU due to sluggish demand and growing competition over power generation insulators in Chinese markets. We deemed this to be unavoidable in order for us to continue our mission of contributing to society through business. While we are flexible in changing the form of our business, we have also consistently pursued an ideal that must not be changed. That ideal is expressed in NGK Group Philosophy that was modified on the occasion of the 100th anniversary of our founding, “Enriching Human Life by Adding New Value to Society.” There are things that must be changed, such as the form of our business in accordance with changes in the surrounding environment, and there are things that must not be changed, such as our NGK Group mission and values. We must pursue both of these directions. This attitude is carried over into NGK’s global expansion.